Simulators are universally recognized as training and evaluation tools and are used in the WorldSkills Competition, of which Sinapse is a sponsor. We already have a training press — do we need a simulator too? How can simulators provide a stimulating learning experience? Why are simulators good at developing problem-solving skills? What about improving quality control skills and use of tools? How can we evaluate the student’s progress ? What comes with the Simulator? How to motivate students to use the simulator? What about Cross Training & Different Skill Levels? Can we integrate the simulator with other courses? What about using simulators in universities? Is there a network version? How about Distance Learning and Outreach? How many students per simulator? What are the cost justifications to invest in simulators? Summary Why Use a Print Simulator? Yes: Simulators increase overall learning efficiency, with a better process understanding and develops problem skills more rapidly. Simulation exercises reinforce printing “experience” without c*onstraints of cost or press availability. Simulation is the intermediate step between a theoretical lesson and real application. Extends useful life of an existing training press and eliminates need to invest in new press technology hardware. A “simple” press with non-automated controls provide students with a clearer understanding of what is behind a push button of new technologies. Control console technology is extremely well replicated on the simulator and can be updated at a fraction of the price for a press. Yes: Schools unable to purchase a press have found simulation is a very good alternative. Many schools provide multi process press training (sheetfed, flexo, heatset, etc) without a single ‘hard’ press. But: At some point a minimum “hands-on” work on a press is needed to experience physical handling of plates and ink, setting rollers and fitting blankets, running up to color, control of ink/water balance, etc. Many schools organize this “hands-on” work with industry. Yes: Simulators increase familiarization and confidence of press operation. Easy demonstration of the consequences of bad decisions and poor practices without the risk of accidents or damage. Problem solving skills can be more highly developed on a simulator rather than just on a press. Many printing problems occur only rarely on a real press but can be created easily on a simulator. It is simple and easy to reproduce single or multiple printing and press problems on demand. ’Digital Native’ generation likes to work with computers. The “fun” element is motivating for students. Young students enjoy learning especially when they are unaware of the “work” they are doing. They can “play” by pushing press performance to the limits and provoke accidents that can never be allowed on a real press. Training can include informal competitions and recognition of ‘winners’ (the association of a “game” with an analysis is not possible on a real press). Experienced press operators learn to solve problems as they occur over long periods of time. Teaching problem solving on a real press is difficult because of the high costs of staging many problems and their unpredictability. Simulators have no such limitations and allow faster learning of broader problem solving skills. It is a tool that allows students to “see” what is not working and to analyse their errors in order to develop the right reflex at the right moment. Let the students make their mistakes and find the best solution – no cost. Simulators allow students to try different ways to solve a problem without the stress of a real situation. Simulators encourage systematic use of built-in quality control tools — including spectrophotometer, densitometer, gloss meter & magnifier. For example: above we see (left to right): “circumferential slur” (blanket packing too thick), “dot gain” (plate/blanket pressure too high), and “correct dot size (no problem). Both the Slur and the Gain make the magenta look too high: but the densitometer will show that the density is correct! Thus the student can make the right choice on how to solve the problem – because they know how to use the information from the control tools. The simulators come with a Administrator tool called the Educational Server (ES). Create and compare ‘benchmark’ reports for individual trainees, groups, and sites. Identify who is having problems and needs more coaching. Individual analysis allows the instructor to review a student’s progress and problems, with an automatic comparison of a student solution with a “recommended solution”. The Educational Server centralizes information for the training environment with simulator exercises, print jobs, and multimedia links accessible from any workstation. Automatic Session Analysis (ASA): Compares the trainee’s session to a “reference solution”, and shows the results in different ways. The Green, Orange and Red lights indicate whether the trainee results were within ‘n’ % of the reference, and the detailed comparisons help highlight the problem areas. These show the results for each trainee and exercise. These are shown compared to other trainees, production sites, and to the “reference solution”. 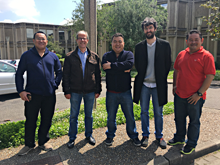 This report gives the trainer and administrators an overview of the use of the simulator and the problems and progress of individuals and groups. More ‘objective” environment for evaluation – same for everyone and can be tied into “certification” procedures. Provides basis of standardized, equal and repeatable evaluation. Independent of material, climatic and other variables, free of influence from interpersonal relations, or subjective methods. Some simulators also include additional scenarios to for more sophisticated problem solving; and administrator versions showing both problems and solutions. 3 study units introduce the SHOTS simulator and the sheetfed process. 3 study units with 50 pre-set exercises addressing the items in the previous units. Administrators’ solution documents for workbooks and pre-set exercises. 140 exercises following the principles of the GATF Sheetfed Offset Press Training Program. Administrators’ solution documents for practice press pre-set exercises. 1. Introduction: Make sure students succeed from the beginning. It generally takes 3 to 5 sessions for students to become comfortable with moving around the virtual pressroom. Start with short 20-30 minutes sessions. 2. Begin with simple problems to solve, e.g. "too much magenta", "ink stroke too high", "cyan out of register", "magenta high", "yellow and black out of register. 3. Progressively introduce quality control tools: Densitometer, gloss meter, etc. 4. Competitions make the sessions more fun, e.g. who can solve problems at the lowest production cost. (Competition problems from past contests and WorldSkills competitions are included with documentation) Left: French students during the first SHOTS contest. After users become comfortable what next? 5. Intermediate level: Sessions become longer, between 40 to 75 minutes. 6. Comparatively simple sets of multiple problems of the same type, e.g. Printing: Color and register; Mechanical: Blanket packing; Materials handling: Tension and folder (web) or feeder/delivery (sheetfed); Chemistry issues. 7. Trouble shooting using QC (quality control tools e.g. densitometer). The tools help to solve problems more quickly at lower cost (most users report a sharp increase in use of QC tools after simulator training). Many of these steps are included in the “practice press” exercises – in particular for the Sheetfed Simulator. All exercises should be reviewed by the trainer to ensure that certain skills have been learned and retained, e.g. the trainee should be able to differentiate between density and pressure problems. Simulators can be used by management trainees and graphic arts design students to provide them with better awareness of the printing process. Excellent for training people entering the job market. Excellent for retraining people changing their skills. Simulators can be used to cross-train and raise print awareness of prepress, postpress, customer and sales staff. Yes: Existing course material that is readable on a computer can be integrated into the simulator. 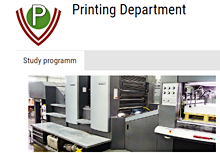 Providing students with a hands-on practical understanding of multiple printing processes. Stimulation of discussions on supply chains, materials, quality control, SPC, role of training in production environment, etc. Offers management students the possibility to learn how processes can be optimized and the impact on costs from multiple variables — the simulators costing feature is a valuable tool for this. Stuttgart HdM reports the combination of ‘”fun and learning” has doubled enrolment for the subject. Grades in press-related exams have improved since the introduction of the simulator. 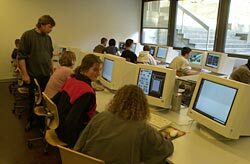 Other universities using Sinapse simulators include Clemson, Ryerson, and Wisconsin Stout in North America; Helsinki, Grenoble and Stuttgart in Europe; RMIT and BICG in Asia. and allows “n” simultaneous users. The number of “active seats” are related to the number of licenses. For example, it is possible to install the simulator on 40 computers (e.g. 2 or 3 classrooms) and run only 10 at once (depending on active licenses). The educational server enables a trainee to sign on at any workstation, while the results will be centralized for the instructor. Allows educators to act as trainers for smaller companies who have purchased their own simulator. Internet technology lets trainers “look over their shoulders” of student for tutoring, and to review results. The instructor verifies the results and helps the trainees asynchronously or in real-time. Remote trainees in external companies can use the simulator and its related training environment. They use the same workbooks and have the same proof of training and possibility of Training Certificates. Significant reduction of travel time and costs. 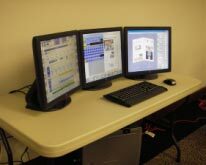 University of West Virginia has installed its newspaper simulator on 3 screens. What about running the simulator on Apple platforms? Sinapse simulators have been developed for Windows industrial environments that is used by most press operating systems. Under certain circumstances they can be run on an Apple platform using Windows emulation. However, there are compatibility issues, running on multiple screens is not satisfactory, and Sinapse cannot warrant current performance or future compatibility. Purchase costs: Requires access to finance new press hardware that can cost millions. New presses theoretically need to operate 16-24 hours a day — conditions difficult to achieve in training. Running costs: Press requires significant floor space, spares, maintenance, insurance, etc. Operating costs: Paper, ink, other consumables. Setup/Clean-up: 50% of press time is not used for actual production. In contrast, simulators have very low capital and operating costs, use no consumables, and have low risk of accident, injuries and damage. 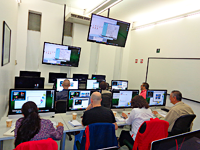 Over hundreds of schools and training centers use Sinapse print simulators all over the world. We suggest that you have a look at this short presentation prepared by Mrs Eva Paap from HdM Stuttgart, one of the major German Graphic Arts Schools. In this she explains how the school integrated the sheetfed and heatset simulators in its curriculum. The Hdm currently has 4 sheetfed and 2 web heatset simulators.